Right now I am looking at my laptop. To me it appears to be grey and black. Or at least, “grey” and “black” are the names I’ve come to associate with the colour experiences that I have when I look at it. Convention being what it is, you would probably associate the same names with your colour experiences of my laptop, but would our colour experiences really be the same? How do I know that your “black”-experience is not similar to my “green”-experiences? These questions point us toward the problem of absent or inverted qualia. This problem forms the basis of an objection to mind-body physicalism that will be front and centre in today’s post. 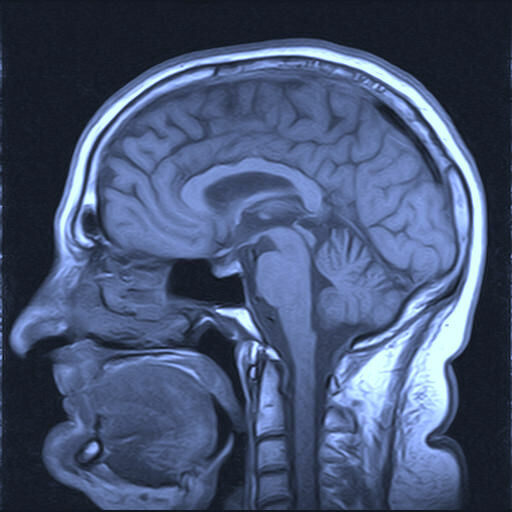 The post is part of a series on mind-body physicalism. And the series follows the material in William Jaworski’s Philosophy of Mind: a Comprehensive Introduction . (1) If absent or inverted qualia are possible, then physicalism is false. (2) Absent or inverted qualia are possible. (3) Therefore, physicalism is false. On the face of it, this is very simple stuff. But, of course, the devil is in the detail. We need to know exactly what absent or inverted qualia are and why they imply that physicalism is false; and we also need to know why absent or inverted qualia are possible. Let’s look at each of these issues in turn. Inverted qualia are easily explained since they were alluded to in the intro. Qualia can be said to be inverted if different people have different qualitative experiences associated with the sensation of the same objects or states of affairs. As in your “black”-experience is equivalent to my “green”-experience. Absent qualia are slightly different. They can be explained by reference to the (infamous) philosophical concept of zombies. These are beings who are externally identical to us - i.e. they walk the same walk, and talk the same talk - but who completely lack the qualitative experiences we associate with activities such as walking and talking (note: there’s nothing special about these activities; I chose them for illustrative purposes only). (4) If physicalism is true, then qualitative states (qualia) must identical to specific physical states. (5) If absent or inverted qualia are possible, then the same physical state can be associated with completely different qualitative states. (3) Therefore, if absent or inverted qualia are possible, physicalism is false. Finally, let’s move on to consider why absent or inverted qualia are possible. Again, if you’ve been following this series closely, it should come as no surprise to learn that a conceivability-possibility principle is doing all the work here. Proponents of the argument will say that since zombies and inverted qualia are conceivable (you just conceived of them as you were reading this, right? ), they are also metaphysically possible. Hence, premise (2) of the argument is justified. In Chapter 4, Jaworski doesn’t go into the various responses to this argument in any great depth. This is mainly because he addresses them elsewhere in the book. His discussion of this argument is among the first stops on a very long trek through all the different physicalist theories. Still, a few words can be said about possible responses. First, the argument relies on the dubious conceivability-possibility principle. We discussed the problems with this when looking at substance dualism. I advise the interested reader to read back over that discussion. In any event, even if the principle is sound, it is open to the physicalist to object to the true conceivability of absent or inverted qualia. They could say that the relevantly similar physical states must, necessarily, be associated with the same qualitative states. In doing so, they can challenge the proponent of the argument to come up with a clear and distinct conception of both phenomena. Second, physicalists can reject the reality of qualia. As counterintuitive as it seems, several have taken this route. Daniel Dennett is probably the most well-known exponent of this view, but Wittgenstein’s private language argument has similar implications. Jaworski discusses both in chapter 8. To make this series somewhat self-contained, I’ll present Dennett’s argument now (I won’t evaluate it though). 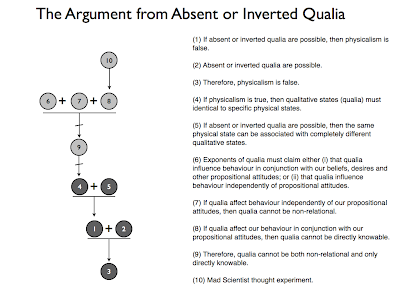 (6) Exponents of qualia must claim either (i) that qualia influence behaviour in conjunction with our beliefs, desires and other propositional attitudes; or (ii) that qualia influence behaviour independently of propositional attitudes. (7) If qualia affect behaviour independently of our propositional attitudes, then qualia cannot be non-relational. (8) If qualia affect our behaviour in conjunction with our propositional attitudes, then qualia cannot be directly knowable. (9) Therefore, qualia cannot be both non-relational and only directly knowable. Premise (6) might seem a little odd, but it makes sense. Speech acts such as verbal reports are a kind of behaviour. So if speech acts like “I see a blue ball” or “I see a red ball” are linked with qualitative experiences — as proponents of qualia would have us believe — then those experiences must exert some influence on our behaviour. Premise (7) is supported by the idea that if qualia directly influence behaviour, then they must do so by playing a direct causal role in behaviour, i.e. < Red quale → “I see red” >. So they would have to be defined in relational, as opposed to non-relational terms. (10) Mad Scientist : A mad scientist has manipulated your brain while you were asleep. When you wake up, you declare that your sensory experiences are qualitatively different from the way they were before. But how can you know this? It could be that the mad scientist succeeded in altering your qualitative experiences, or it could be that he altered your memories. Either is possible if it is “qualia + beliefs” that influence behaviour. One can only tell the difference by knowing something about one’s memories and/or the brain states manipulated by the mad scientist. This probably seems a little strange. It does to me, at any rate. But Dennett argue that denying the existence of qualia need not be as counterintuitive as it first appears. He reckons that a third-person conception of mental phenomena can accommodate most of the facts cited in support of qualia. He does so partly on the grounds that many phenomena that are thought to be non-relational turn out, on closer inspection, to be relational. Like I said, I won’t evaluate this here but one obvious objection should be noted. 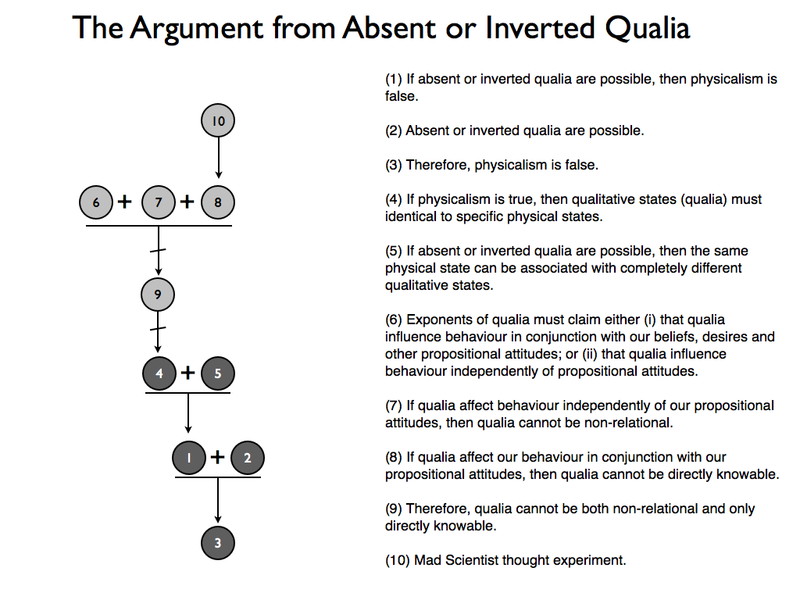 The first premise of Dennett’s argument (premise 6 above) assumes that qualia influence behaviour. There is at least one school of thought — epiphenomenalism — that would deny this. Okay, well that’s it for this series. As I said at the outset, unlike Jaworski’s book, this has been far from a comprehensive assessment of the arguments for and against physicalism. It was only intended to introduce some of the evidence cited in support of physicalism (argument from past explanatory success) and some of the classic objections to the physicalist worldview (Hempel’s dilemma, The Knowledge Argument, and the problem of absent or inverted qualia).